It's been really too too long. I'm really far behind in everything. I know I had a lot of you asking about my health and worried and I want to say thank you so much! I haven't been well lately and I've been hospitalized on and off during the month. I'm just slowly getting back into the swing of things so please forgive my long absence and for those of you who stuck around I'm going to have a huge thank you for you coming up. Now let's talk about something that always makes me happy and has absolutely nothing to do with the necessary evils of medical care - Uberchic Beauty and Pipedream Polish neons! Yas yasss y'all you know I love me some of both of these things. I created this mani seriously ages ago and then finally got around to editing it today. I got these Pipedream's way back in the fall. They are still hard as hell to get but I still love them to death! I've pretty much given up on getting a backup set for my stash even though I would really love one. If you don't have these the Electric Nights Collection from China Glaze is a fantastic alternative, and as you know I love that set just as much. There is no good alternative to the UberChic plates. Just get them. You'll regret it if you don't they are baller ;) Btw I also created a tutorial for this nail art. 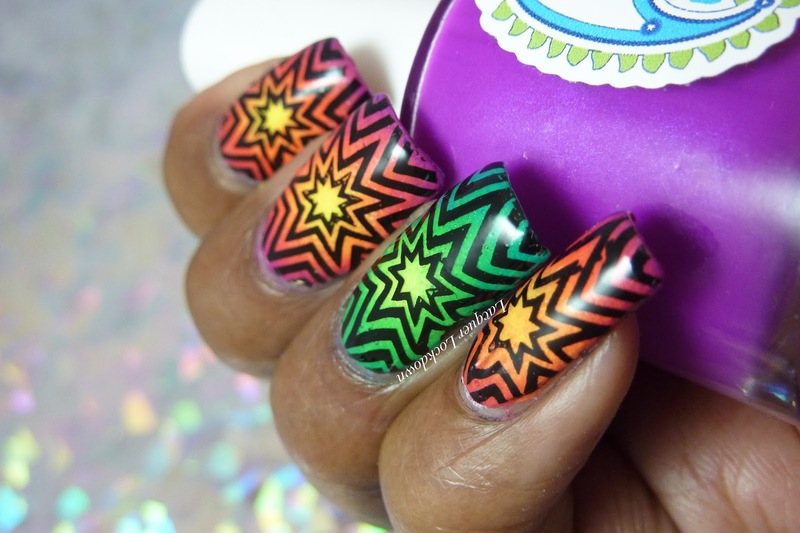 One thing I recommended in the video that I will explain here a bit more is that when you are creating a pattern like this with a radial gradient it's better not to roll the stamper across your nail bed. 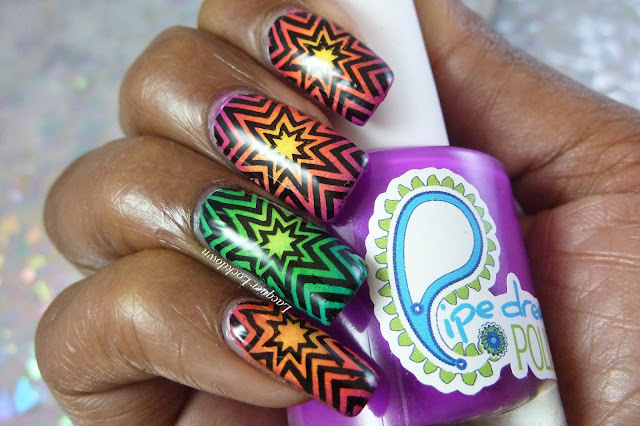 For this kind of art press straight down onto the nail bed instead and the let the stamper "hug" the edges of your nails. This will work even if you have a deadly C-curve like mine. This does however require the use of a marshmallow stamper. I recommend either using the soft set from Messy Mansion or the sets yellow from Fab Ur Nails. The stamper and the holder I used here are both from Fab Ur Nails though the pad is no longer manufactured. So there you have it. So what does everyone think? I hope everyone enjoyed this post and you can look forward to my slow and steady return over the rest of this month and July. I also wanted to point out because it was asked that I start including the links to the products I use on my posts so I have started doing that now. You can find most of the products I listed using the links above in the Mani-louge. I hope everyone is doing well and I'll see you next post! Glad to see you getting back into the swing of things, you've definitely been missed! Thank you darling! I missed reading your comments as well. I'm so far behind and still on the mend so it will be forever till I catch up but thank you so much for sticking with me <3!! !